Dr Tedros Adhanom Ghebreyesus, WHO Director-General, meets Prof. Ogtay Shiraliyev, Minister of Health, during his visit to Azerbaijan on 4–6 July 2018. The Conference was organized to map out work towards achieving the SDGs at the national level, and to synchronize the global SDG targets and indicators with the country’s national priorities and development agenda. It is hoped that the document “Baku Principles for National SDG Mainstreaming and Acceleration”, currently under discussion, will be adopted at a meeting in October this year. In recent years, there has been considerable investment in the health system in Azerbaijan, as well as a strong focus on health at the presidential level. These developments, together with WHO support, have contributed to many health achievements including the elimination of malaria, the country’s achievement of measles-, rubella- and poliomyelitis-free status, and a significant reduction in maternal and child mortality. The ongoing health system reform and piloting of a mandatory health insurance scheme in 3 districts will also contribute to addressing remaining challenges, such as the lack of trained health professionals and the high level of out-of-pocket payments for health care and medicines made by the general public. During the visit, Dr Tedros and Prof. Ogtay Shiraliyev, Minister of Health of Azerbaijan, signed a joint statement underlining their commitment to working towards universal health coverage as a means to achieve better health for everyone, everywhere. Other highlights included a visit to the WHO Collaborating Centre on Prevention and Control of Tuberculosis in Prisons at the Tuberculosis Training Centre, part of the Ministry of Justice. The Director-General also visited the National Centre of Oncology and met with its director and health workers. Dr Tedros held meetings with His Excellency Mr Ilham Aliyev, President of Azerbaijan; Health Minister Shiraliyev; and other Azeri high-level officials including Mr Ali Ahmadov, Deputy Prime Minister of Azerbaijan and Chairman of the National Coordination Council for Sustainable Development, and Mr Elmar Mammadyarov, Minister of Foreign Affairs. 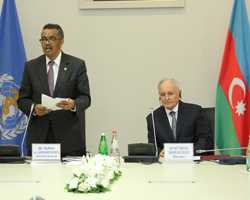 He also visited the WHO Country Office in Baku.